amazing birds. Unfortunately, grasslands are one of the most endangered habitats on earth. They provide rich fodder for grazing cattle, but also host 29 species of birds that need grassland habitat in order to complete their life-cycle. Not all grasslands are the same! Grassland birds evolved with great herds of bison. As the herds moved, some areas were heavily grazed, while others were left to recover. This left a patchwork of habitats, also called a mosaic. Now, some grassland birds need areas with short grass that are heavily grazed, while others need long grass areas that are less disturbed. Eee-oh-eee-oh-lay! That’s the song of the Eastern Meadowlark. Eastern Meadowlarks prefer native grasslands, but they can be found in just about any grassland, such as an airport or farmer’s field, during the breeding season. Although they are quite colorful, meadowlarks are actually part of the blackbird family. 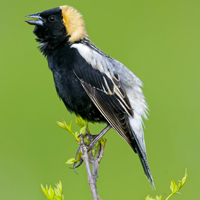 Look for these common grassland birds perched on fence posts in grassy areas and listen for their sweet, lazy song. Shorebirds aren’t always found near the shore! Upland Sandpipers need grasslands. Their long bodies and upright posture distinguish them from many other shorebird species. Unlike McCown’s Longspurs, Upland Sandpipers prefer areas with longer grass. In some regions where native grasslands are sparse, they will sometimes nest in airports. 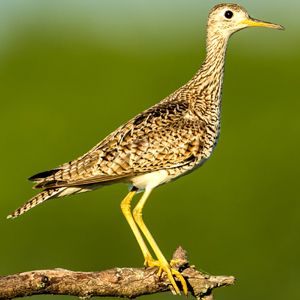 Upland Sandpipers have a crazy song! Watch for them singing from the top of a hay stack or fence post in a grassy area. McCown’s Longspurs have gone through a precipitous decline. Most of their habitat is in private ownership, and they need large areas with very short grass (almost stubble) and a lot of bare ground. This type of habitat is usually created through very intense grazing. These colorful, sparrow-like birds make tiny nests right on the ground. When the bison herds were removed by heavy hunting, this disturbance regime was removed as well. Today, ranchers are working together with conservationists to use herds of cattle to mimic bison-like patterns of disturbance. This has been helping many bird species make a come-back. Check out more of our great sounds of grassland birds (like this Bobolink, and Sandhill Crane), and visit a local grassland this spring!